In preparation of Advent which starts in a couple of weeks I purchased a new Advent story book and I am VERY impressed with it. I have skim read it and can't wait to start reading it on the first of December to Sir N.
Quote from Christian Book.com: As Mr. Butterfield carves a Jesse Tree in an old dusty church, a curious young boy distracts him, asking about the various symbols on the tree. Against his better judgment, the old man finds himself retelling the familiar Biblical tales that trace the lineage of Christ, from the Garden of Eden to Jesus' birth. 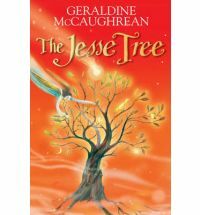 Under the carpenter's skilled hands, the Jesse tree grows--and an unlikely friendship begins to take root as well. Looks like a good book, Chareen. Do you do a Jesse tree devotion, in Advent, too? We have Scripture readings and prayers, each day, and build a Jesse tree. It helps us to prepare and stay focused with all the commercialism that happens. I am impressed with this book. It has all the stories from the bible in it. I did a Jesse tree once but have not done it again. I found a blog post about making a magnetic Jesse Tree for the fridge and it comes with all the scripture readings for this year. I just got my supplies together and will be making this and blogging about it next week. Do you have a post about your Jesse Tee with Pictures ?? I don't have a post, Chareen, because we didn't have a blog, last Christmas. For the past few years, our Jesse tree has been a small Christmas tree with gold baubles with Scripture verses on them but, we used to use printed ornaments from the Internet. This year, I'm hoping to make ornaments out of baked dough.